Welcome to our website. 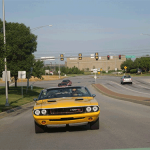 We are currently the largest MOPAR club in the Midwest area and enjoy a number of events and gatherings throughout the year. Our membership is open to “all” Mopars to include Chrysler, Dodge Plymouth, Desoto, Jeep and AMC products. It doesn’t matter the year, and you do not have to own one to join our club. As part of your membership, you will receive a membership card, notification of events and (6) issues of our club newsletter thru the year and a vast friendship of fellow Mopar enthusiasts. Please consider joining, or possibly attend a show or function and meet some of members and see what our club represents.